"Everyone must be his own scavenger"
My two cents to Baapu today, the only thing he can do is this, leap out of this beautiful street art and do the needful. I have been commuting through Bannerghatta Road of Bangalore for the past two years; and I must say that once upon a time this place looked a tad bit better. This is somewhere on the five hundred metre stretch from Shopper’s Stop to the Jeddimara junction, right on the main road, travelling on this road is as good as getting a breath holding test done to check your cardiopulmonary reserve. I stopped by and clicked a picture today for it is something which perfectly defines our defiance amidst all the celebrations. 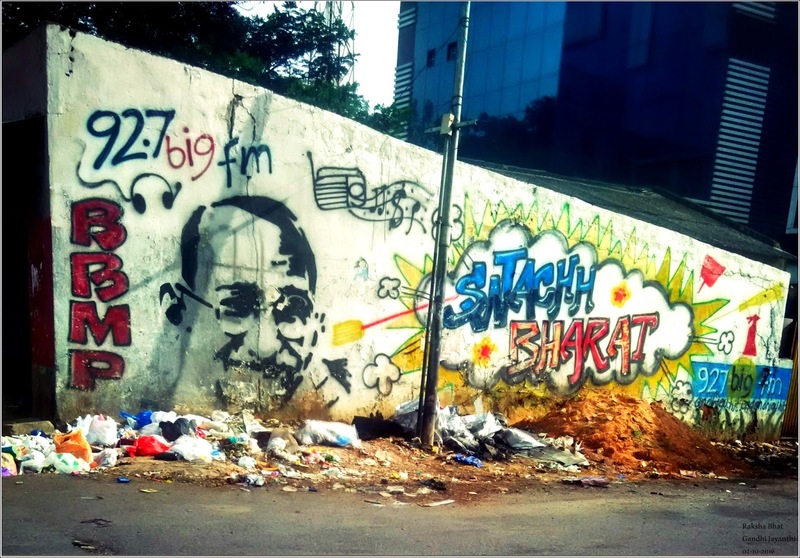 People have thrown enough garbage for Gandhi to do his part, to be his own scavenger! Today on the birth anniversary of Gandhiji and Shastrji our Prime Minister and our government with all the ‘Swachh Bharat Abhiyan’ wants us to make this unfathomable dream of a clean India come true. Before we catch hold of a broom and pose for a photograph and send it across as requested, well there is a lot of introspection to do. Every time I pass by this place, I think of the Samaritan who drew this on the wall, I think of his or her effort and of all the people who may see it. I wonder how many of us can figure out the intention behind this art. It is to create a new mindset and to educate people but look at all the garbage around! Ironically ‘Shramdaan’ happens only on days such as today and constructing ’Shouchalyas’ remain only as winsome advices from film stars. A while before I clicked this picture a man was happily taking a leak and a few others were tip toeing around awaiting their turn. Nature calls in the wee hours of morning you see. Civility demanded I turn around and look at the other side, that's the most I could do! Normally it is impossible to walk on this stretch of the road, with children defecating on the footpath, garbage and filth piled at every twenty feet of distance and the Bruhat Bengaluru Mahanagara Palike workers half willingly cleaning and scavenging the area. And mind you this is all on one of the busiest roads of the Garden City and Silicon Valley of India, the situation elsewhere in Bengaluru I bet isn’t any different. I wish the Palike of our city and the people of this locality looked into this matter, at least today. Look at our Baapu smiling on the wall despite what he has been offered! Before we think on what is the best tribute we pay our leaders and country, we as citizens are duty bound to sustain what we have already been provided with, knowledge or amenities. Somehow in India, this never seems to happen. Lakhs of villages and hundreds of cities are now declared Open Defecation Free. Bless the data and statistics, let us include them in our bag of achievements. All the advertisements and campaigns in fact are nothing but a veil of development; our Indianness is here to stay for a long time to come. So what am I complaining about? Well I could have gone ahead with an enthusiastic team today [of which there is no dearth especially on such occasions!] to clean this place and sent a picture to Modiji, put it up on social media and all. You know with the masks and caps and tees and boots and brooms in hand but which fellow Indian can assure me that after a couple of months this place will not bear the brunt again? I cannot wait till the next Gandhi Jayanthi or any other Jayanthi for that matter to go ahead and clean my Bengaluru. I am writing this with a larger issue in mind, of personal hygiene and a sense of personal health. One cannot expect one’s neighbour to come and scoop up what one throws on the road. Unless every individual realizes that his own cleanliness comes before his own happiness and somebody else's too, all community efforts are futile. Let godliness stay where it wants, to each his own. When it comes to cleanliness, nobody can better our lives. We have to do it ourselves, it's a responsibility which is strictly personal, just like one's belief.